Mike Konczal has a nice primer over at the Atlantic about high frequency trading. You’re likely to hear a lot more about this subject in days to come, so it’s worth a few minutes to head on over and read it. 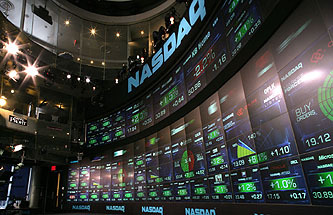 As the debate unfolds, remember to ask yourself, (1) whose information is being exploited by whom and how, (2) does this make financial markets stronger and more efficient — say by providing liquidity — during a downturn when markets need them the most, and (3) what is this doing to the price mechanism — is it helping prices converge to fundamental values or driving them further away? The evidence currently looks like HFT is doing bad things on all three accounts. As Konczal points out, if you ask the HFT community what benefit HFT provides, the answer is usually “liquidity.” But this is an answer that should be treated very skeptically indeed. Major stock exchanges are not notably illiquid except under very specific, limited circumstances, and HFT traders aren’t obligated to provide liquidity under these circumstances anyway. And they won’t. They’ll just flee, like everyone else. So: cui bono? As near as I can tell, HFT is just a pure, artificial money spinning machine with no value at all to the wider financial community. In fact, as Konczal points out, it’s quite likely to make markets weaker and less driven by fundamentals. This is worth keeping your eyes on.